So, despite winning 5 of 6 over the past week against two teams that havn’t really been trying for years, the Nats …. failed to make up a single game on Philly and head into the Atlanta series 6 games out. That’s because Philly was also playing a team that isn’t really trying (Miami), and just finished off a nifty 4-game sweep at home. So here it is. I’ve already basically written off the season … but hey, maybe if the team plays a 22-7 August … and both Atlanta and Philly scuffle along at .500 … they can get close. But to play a 22-7 august … they need to take 3 of 4 against Atlanta this week. Game 1: Max Fried versus Jefry Rodriguez. Hmm. Not a good start, having to call up a guy who has now fallen behind Tommy Milone on the depth chart. I see the Braves jumping out to a quick 4 run lead and the “veteran leadership” packing it in early to regroup for the nightcap. Game 2: Sean Newcomb vs Max Scherzer. Scherzer will probably be unhittable, but Newcomb nearly threw a no-hitter against the Dodgers his last time out. I see this as a close Nats win. Game 3: Mike Foltynewicz vs Tommy Milone: Atlanta’s best pitcher in 2018 versus the Nats … #10 starter? #9? Foltynewicz has already started against the Nats four times, throwing a 2-hit shutout against them in June (albeit in Atlanta). Odds are he’ll give up a few runs on the road against the Nats … can Milone keep up his magic show? Game 4: Anibel Sanchez vs Gio Gonzalez. Sanchez has been pretty good. Gio has not. Any guesses how I think this one will go? So, you squint at these match-ups and … well a series split seems like an optimistic outcome. Frankly, I could see just winning the Scherzer start and the other starters getting bombed by Atlanta’s youthful, powerful lineup. The Phillies head to Arizona (tough), then to San Diego (not so tough) … but a 2-2 or even a 1-3 series here could really spell the end of it. how are you feeling, heading into this series? USA Today just came out with their pre-season 2014 top -25 High School Baseball rankings (to go along with Baseball America’s pre-season top 50 and Maxpreps.com’s top 100 pre-season rankings), and a number of familiar national High Schools are on the various lists. I thought it was a good time to publish the review of Local and National high school baseball powers that I’ve had in draft status for a while. I touched on the topic of High Schools who consistently generate talent briefly in January 2013, when I penned a post delving into the best players the State of Virginia has produced. If you’re interested in the best producing Virginia High Schools there’s a section in that January 2013 post on the topic. Despite having some significant talent come out of the state recently, there is no high school in our area that comes close to producing what some of these schools in Florida, California and Texas do. At the bottom here I’ll talk briefly about significant local schools. Lets take a look at some of these baseball factories and look at some of the big-time talent they’ve produced lately. I’ll freely admit that this is mostly analysis of teams that have been good lately … but i’ve tried not to fall into the habit of picking a team that just happens to be good now by looking at the performances of these teams over the past 4-5 years. Suffice it to say; one class of great players can make a team very highly ranked for a year or two, but you need to consistently develop players to constantly be considered among the best programs in the country. Here we go. In each case if they’re pre-season ranked I’ll use a quick short-hand so as not to repeat typing the same things over and over. (X,Y,Z) after each high school mean’s the team is pre-season ranked by in order by USA Today, Baseball America and Max Preps. Archbishop McCarthy HS, Southwest Ranches, Fla (#1,7,1); They have won four consecutive Florida 6a titles and are the 2014 preseason#1 ranked team by USA-Today They’ve had no less than eight draftees in the last four drafts, including two first rounders (presumptive 3B starter in Detroit Nick Castellanos and Nick Travieso in 2012). This is a seriously good baseball program. Harvard-Westlake HS in Studio City, California (Los Angeles) (7,8,7). Alma Mater of our own Lucas Giolito, but was also home to another 2012 first round pick Max Fried. Can you imagine a high school team with two first round pitching prospects? Also the alma mater of current MLBers Josh Satin and Brennan Boesch, both of whom were drafted out of Cal-Berkeley, and 2013 2nd round pick Austin Wilson out of Stanford. A good pedigree of recent high-end talent. The Woodlands HS in The Woodlands, Texas (#29,NR,NR). Alma Mater to 2011 #2 overall pick Jamison Taillon and 2011 3rd round pitcher Bryan Brickhouse. More recently, home to 2013 3rd rounder Carter Hope. All three of these guys were big-time right-handed pitching prospects. Also home to two current MLBers: Kyle Drabek (a 2006 1st round pick) and Paul Goldschmidt (an 8th round pick after going to college). They’re a bit down this year, but have been highly ranked for years. Defending Texas 5-A champs, no small feat. American Heritage HS, Plantation, Fla. (#3,24,14). 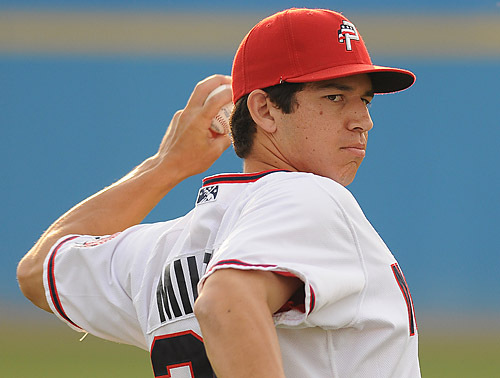 Began gaining notice after producing both #3 overall 2008 pick Eric Hosmer and (former) Nats prospect Adrian Nieto in 2008; since has produced another 6-8 draft prospects. Enters 2014 with a preseason #3 ranking from Usa-Today and should match up well with Archbishop McCarthy (if they are scheduled to play). Owasso (Okla.) HS. (#4,4,2) 2014 Preseason USA-today #4 team who went 36-0 last season and returns seven starters. Recent alumni include two first round draftees in St. Louis’ Pete Kozma and the likely more impactful Dylan Bundy, Baltimore’s #1 prospect, who reached the majors by age 20 and is currently rehabbing a Tommy John injury. Barbe HS, Lake Charles, LA (#8,6,6). Getting some pre-season 2014 credit thanks to a slew of Division 1-signed talent; had three players drafted from its 2010 team. Of local interest to yours truly because Lake Charles is where my wife hails from and where we go married. Bishop Gorman HS, Las Vegas: (#12,13,9) his sports powerhouse is also routinely nationally ranked in Football and Basketball, and has matriculated a handful of local players lately (including supplemental 1st rounder Joey Gallo in 2012). They were the defending Nevada state champions seven times before losing in the final last year. This is not however the alma-mater of our own Bryce Harper: he went to Las Vegas HS, which doesn’t have nearly the alumni pedigree as Gorman. Archbishop Moeller HS, Cincinnati (#17,30,10). Moeller has a very rich history; its alums include Buddy Bell and his sons, Ken Griffey Jr and Barry Larkin. They’ve had at least 11 alumni play pro-ball. And they’re back in the national scene, ranked #17 pre-season by USA-Today for 2014. Rancho Bernardo, San Diego: (NR, #3, #24): this school’s nickname is “the Factory,” so I had to put it in here. Home to 3 current major leaguers (including Cole Hamels) and a whole slew of recent draftees. Venice (Fla.) HS (#15,1,4). A johnny come-lately to the party: they’re also a defending Florida state champ (in a different class than Archbishop McCarthy) and are the #1 ranked pre-season team by Baseball America. Not a ton of alumni history here, but they are #1 in one of the three main publications i’m using as reference here. Broken Arrow (Okla.) HS (NR,#15,NR): Broken Arrow had three members of its 2011 team picked, including upper 1st round talent Archie Bradley. They’ve had a few MLB alumni and are routinely in the latter stages of the Oklahoma state tournament. St. Francis HS Mountain View, CA (#27,2,12): some interesting spread between the three rankings for St. Francis, based in Mountain View, CA. They have a slew of alumni currently playing college or pro ball and are #2 in Baseball America’s pre-season rankings for 2014. Seton Hall Prep, West Orange NJ: (NR on any 2014 list) the rare cold-weather school with significant pro matriculation. Detroit’s Rick Porcello hails from Seton Hall Prep, though the most famous New Jersey native in the majors (Mike Trout) attended a different HS (Milleville HS) and is the first player from his HS to make the majors since the 1940s. Hillsborough HS in Tampa (NR on any 2014 list) boasts 41 pro alumni and 10 with MLB experience, including Gary Sheffield, Dwight Gooden, Carl Everett and former Nat Elijah Dukes. Jesuit HS, Tampa: (#26,NR,NR). Another high school in Tampa that has a huge alumni base in pro ball; 10 major leaguers and 74 players in pro-ball (per baseball cube). Lakewood HS in Orange County (NR on any 2014 list) has 57 pro alumni and 12 MLB experienced players, though not nearly of the name quality of Hillsborough’s graduates. However, it has had a great run as of late, having graduates play in three straight World Series. Sarasota HS in Florida (#37,NR,NR) also boasts 57 pro player alumni, 14 MLB pros including our own Ian Desmond. There’s a HS in Oakland called McClymonds that has two Hall of Fame alumni (Frank Robinson and Ernie Lombardi), a host of other famous names from 60s and 70s but which hasn’t generated a pro player since the mid 1970s. Per its wikipedia page it only has about 250 students now; I wonder if they even still field a baseball team. Polytechnic HS in Long Beach (NR on any 2014 list) has 47 pro alumni but an astonishing 18 guys with MLB experience, headlined by Hall of Famer Tony Gwynn and possibly future hall of famer Chase Utley. Mater Dei HS, Santa Ana, Calif. (NR on any 2014 list): 9 major leaguers among at least 40 pro alumni, including Washington’s Danny Espinosa. Special Mention: the Puerto Rican Baseball Academy is technically a high school and easily has the highest number of drafted players (111 in baseball Cube’s records). Most recently, 1-1 pick Carlos Correa is an alumni, though he’s one of just two 1st rounders out of this school that I can see. Riverdale Baptist HS, Upper Marlboro MD. They have quite a few players in the NCAA ranks but few who have lasted long in the pros. St. John’s HS (Washington, DC); they’ve had some recent draft success and have sent players to good schools. Past these two schools, it does seem like certain local public programs are always doing well. Dematha is getting some national ranking mentions pre-season but doesn’t have the baseball pedigree that they have in Football and Basketball. Vienna programs Oakton and Madison HS are constantly in the mix locally and state-wide, a product of a fabulous youth program that feeds into both those schools. Finally, the two largest schools in the area (Lake Braddock and Robinson) routinely advance far in the regional tournaments, thanks in part to an enrollment that rivals some colleges. But they’re hardly “factories” like the above school, nor do they put out the kind of upper-end players that Florida and California schools can. For some historical perspective, here’s a slew of links to pre- and post-season rankings that i’ve collected for the past few years, with #1 national team and any local schools noted. 2014 USA Today pre-season top -25 High School Baseball rankings: Archbishop McCarthy #1, Great Bridge and Hanover in the #40s from Virginia. 2014 Baseball America’s pre-season top 50:Venice HS in Florida #1, defending VA state champ Hanover in Mechanicsburg is #18, Baltimore’s Calvert Hall #35. St. John’s in DC #47. 2014 Maxpreps.com’s top 100 pre-season rankings: Archbishop McCarthy #1. Hanover #19, Great Bridge #26. 2013 Baseball America final HS top 25 rankings: Harvard-Westlake #1. Virginia schools Madison and Great Bridge dropped out after losses in regional tourneys. VA State champ Hanover not ranked in the top 25 after their upset state championship. 2013 MaxPreps Final top 50: Pensacola, FL #1 overall. 2012 Baseball America final HS top 25 rankings: Parkview (GA) #1. Lake Braddock finishes #31 after winning VA state title. 2011 Baseball America final HS top 25 rankings: Archbishop McCarthy #1. Great Bridge #28, South County #37 after suffering its only loss on the season to Great Bridge in the final. 2010 Baseball America/Baseball Coaches of America final top 50. Flanagan HS in Florida #1. West Springfield HS #24, Woodbridge #32 after West Springfield beat Woodbridge in the state final. 2010 MaxPreps Final top 100: Sumrall, MS #1. 2010 Baseball America pre-season: Bellaire, TX #1. Defending VA state champ Menchville out of Newport News pre-season #6, Severna Park #25 pre-season. Baseball-Reference.com direct link to all High Schools in the database. TheBaseballCube.com: just search for players or schools; sometimes has better information than baseball-reference.com. Here is a direct link at Baseball Cube listing the number of alumni per high school in their database. List of Virginia State High School Champions: all sports, but Baseball is at the top. Did I miss any? Please discuss. Post-publishing Update Mar 2015: digging around thebaseballcube.com, I found this link of historical rankings of HS by BA over the years. Will use this link if I ever re-visit this post.